Hand built in the UK, this machine has twin spray nozzles, a large 30 litre tank, a lift-out battery for charging and full access to battery and pump. As with all of these spray jet machines you have to flush out the tank after every session. A filtred paint compound is also recommended, rather than what you may normally use in a standard transfer machine. It has twin nozzles, both because some venues like to lay down a double line in one go and also as a bonus if one nozzle gets clogged, you can switch to the other. Comes with the battery and some cleaner. 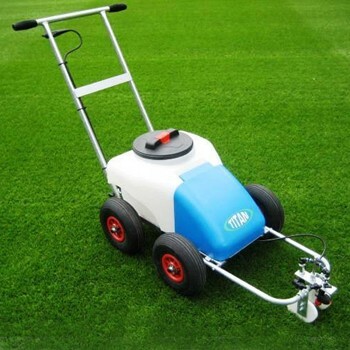 10 – 12 litres (when diluted) should mark out approx one football pitch so the 30 litre tank could probably be OK for 2 –3 pitches depending on how fast you walk. The machine has good pneumatic wheels and a broad wheelbase so it is easier to push than some models.